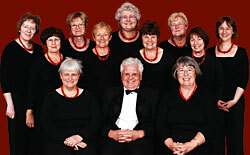 The choir is young in choral society terms, having been founded in 1990. With forty singers and David Muggleton as its Musical Director, Daventry Choral Society gave its first concert, Fauré’s Requiem at Holy Cross Church, Daventry on Palm Sunday that year. 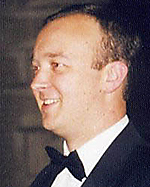 In 1992 Giles Turner took over as Musical Director and with his strong choral expertise, the choir earned a reputation for high choral standards and innovation under his leadership. In 2001 the choir performed David Fisher’s Requiem, a work commissioned by the Society, in which we involved the local community and District Council. 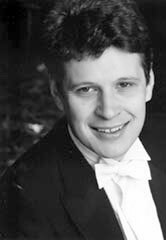 In 2002 we welcomed Alexander Walker as Musical Director and thrived on his orchestral and musical expertise, reaching higher levels of musicality. During his nine years with us we performed a wide variety of works including Haydn’s Creation with the City of London Sinfonia as well as appearing at Northampton Derngate and the Royal Albert Hall. To see details of previous concerts click here. Alex has now moved on to further his international career. We have appreciated the patronage of our two Presidents. 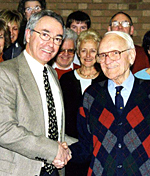 Stanley Unwin became President in 1990; originally an engineer with the BBC, he had been based in Daventry and lived in Long Buckby. In 1960 his career as a professional entertainer took off and he became renowned worldwide in this role. As his health failed, our current President, David Saint took over and has been a constant supporter of our concerts and activities. We have gained recognition and awards from East Midlands Arts, Daventry District Council, the Millennium Fund – Awards for All and R. Griggs Arts Marketing Fund.